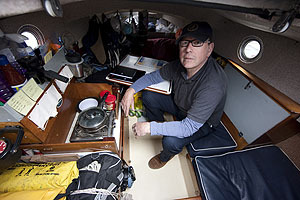 One of the most intriguing sailors I met when I went to the start of the Jester Challenge solo transatlantic race in Plymouth in May was Roger Taylor, pictured above aboard his bilge-keel, junk-rigged Corribee 21 Mingming. Roger is the last of the solo sailors in this rather cultish event for yachts of under 30ft to return home. He retired to Plymouth, whence he’d set off, without making landfall anywhere after a truly extraordinary voyage of 4,084 miles. When I spoke to Roger he was clear that he was not going to sailing towards Newport, as were the others in the Jester Challenge. It was his intention to sail to Baffin Island, hopefully to land there, and come back to Plymouth since it was not possible for him to make Newport and back in one season. He managed to make it back safely, without assistance, despite being knocked down in very heavy weather in the Davis Strait. The boat was hit by a rogue wave which gybed the boat and put Roger on the uphill side of the boat ‘before putting her on her beam ends and very neatly flipping me off my bunk,’ he reports. He broke a rib in the fall and decided he could not continue, even though Mingming was only 350 miles from the Arctic Circle. But rather than give up or ask for help, Roger turned back and sailed back to Plymouth, a return trip of over 2,000 miles taking another 33 days. Roger is a devotee of adventurous small boat voyages. You and I might not think a bilge keel Corribee the best suited to high latitudes voyaging, but he disagrees – and he’s fully qualified to say so. Roger completed the Jester Challenge to Newport in 2006 and last summer he sailed Mingming single-handed north to Svalbard and the Jan Mayen islands, returning by way of Greenland. Roger never stopped or went ashore, he sailed into the Arctic Circle and returned home again in 48 days. He loves the junk rig because everything can be adjusted from the safety of the companionway. He mostly rests below where he can just about stretch out to port and describes himself as “a sea troglodyte”. He boasts that on last year’s voyage he didn’t emerge from the cabin for 40 consecutive days. You can read more about Roger, Mingming, the Jester Challenge and the other extraordinary competitors in a big feature in our August issue.